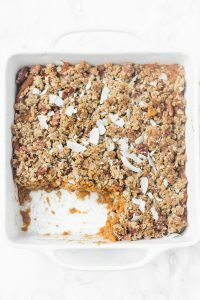 This secretly healthy sweet potato casserole has a rich filling (with coconut milk!) and a sweet, crunchy oat nut topping that’s free of refined sugar! 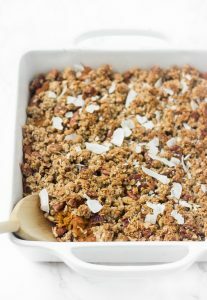 For this healthy sweet potato casserole, I adapted the topping recipe from my favorite healthy apple crisp. There’s almond meal, oats, nuts, cinnamon, and coconut oil (or butter)– all real ingredients with no refined sugar in sight. And the filling is creamy and rich, with the addition of coconut milk. Bake the sweet potatoes in advance. You can cook the sweet potatoes up to a day or two in advance and leave them in your fridge. Then, on Thanksgiving Day, you can mash them up and assemble the casserole. Make the filling and the topping up to two days in advance, and then assemble and bake on Thanksgiving Day. I highly recommend doing this to save time in the kitchen on Thanksgiving! I absolutely love sweet potatoes but for a long time, I didn’t like sweet potato casserole because I thought it was tooth-achingly sweet. Sweet potatoes are already, you know, sweet so they don’t need a ton of adornments, at least in my opinion. My favorite way to enjoy sweet potatoes is with some raw almond butter and a sprinkle of nuts or raisins. But since Thanksgiving is a special day, I think it deserves an extra special sweet potato dish. That’s where this secretly healthy sweet potato casserole comes in. It’s just sweet enough, and it’s made with healthy, whole ingredients so you can feel extra good about eating it. I can’t believe Thanksgiving is just around the corner! I love Thanksgiving because my grandparents and cousins come in town and stay at our house in Raleigh. We have so many fun traditions and it feels so nice to great to have everyone in the same place. • We always eat so much for Thanksgiving lunch that we’re not hungry for the rest of the day. So, we save our Thanksgiving dessert for dinner and eat that instead of a real meal 🙂 That’s the way to do it. • We always play an afternoon game of family kickball. I’m not really sure how, because like I mentioned, we’re really full. But it’s something I look forward to every year. • I didn’t do this last year, but I’ve often done a “Turkey Trot” race on the morning of Thanksgiving. Last year, my sister and I did our own run and ran 14 miles that morning…which meant we were extra hungry later. Perfect! • We watch movies together. I’m not really a movie girl, but over Thanksgiving break, I probably watch more movies than all of the other days of the year combined. • We always have mac ‘n’ cheese. It’s not a totally traditional Thanksgiving recipe but…why not? 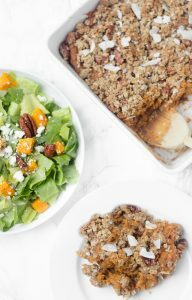 If you try this healthy sweet potato casserole, feel free to let me know in a comment or tag me @livbane on Instagram! Preheat oven to 350 degrees. Wash sweet potatoes and poke a couple of holes in them with a fork. 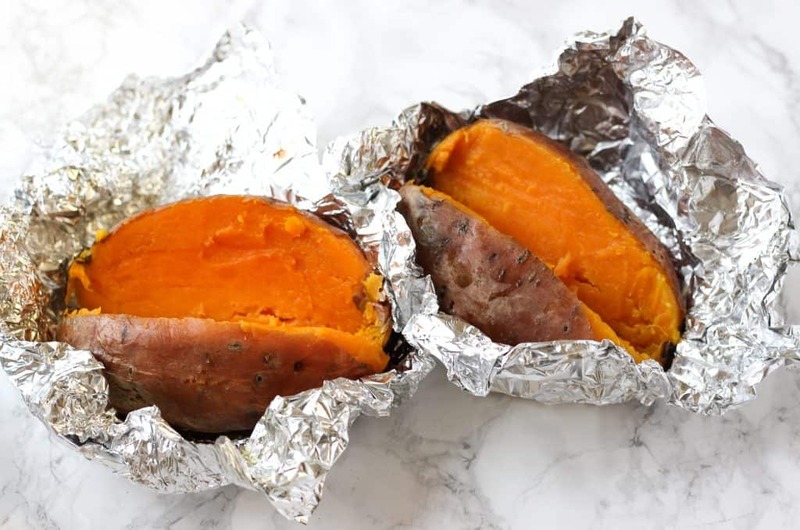 Wrap potatoes in aluminum foil and bake for 50-75 minutes (depending on the size of the potatoes- check at 50 minutes for smaller potatoes). Potatoes are done when you can easily insert a fork into the middle. Cool potatoes slightly, then remove the skin. In a medium bowl, mash potatoes with honey, coconut milk, cinnamon and optional raisins. Spray an 8x8 or 9x9 inch baking dish with cooking spray and add potato mixture. In now-empty mixing bowl, stir together topping ingredients. Spread topping over sweet potatoes. Bake casserole at 350 for 20 minutes, or until topping is lightly brown. Remove from oven and sprinkle with coconut flakes, if using. Serve warm. If baking sweet potato casserole straight from the fridge, cover with aluminum foil and bake for 40-50 total minutes, until heated through. Many people should this recipe because it is lower cal than most, and it is super good! Olivia is an excellent cook. Thanks, Gee 🙂 Looking forward to cooking for you in just over a week! I LOVE sweet potato recipes. 🙂 And I love seeing your Thanksgiving traditions. We always eat enough too for the rest of the day, and dessert is pretty much the only thing we eat later. We love to do a 5k Turkey Trot if we sign up in time, but a 14 mile long run sounds fun too. Yes!! Love that Turkey Trot tradition! 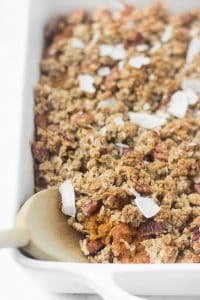 I loveee sweet potato casserole so I’m definitely going to be trying this out soon! And I love that you guys do a non-traditional Thanksgiving dish–mac n’cheese–at your meal. Unique traditions are the best! One of my favorites of our traditions is that my uncle bakes homemade sourdough bread for the big meal that is out-of-this-world good! 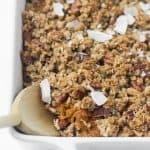 I’ve never had sweet potato casserole before – but I think I need to change that because this looks amazing!! I’m so glad you enjoyed this! Thanks for reporting back!! I’m making this casserole two days before Thanksgiving. Should I bake at 350 for 20 minutes. Then refrigerate. And reheat it on Thanksgiving? Or refrigerate without baking and bake on Thsnksgiving? Thanks for your help. Thanks Liv. I have it in a cooler on my way to PA. Awesome!! Hope y’all enjoy it, and happy Thanksgiving!! !